How Much Information do people receive? 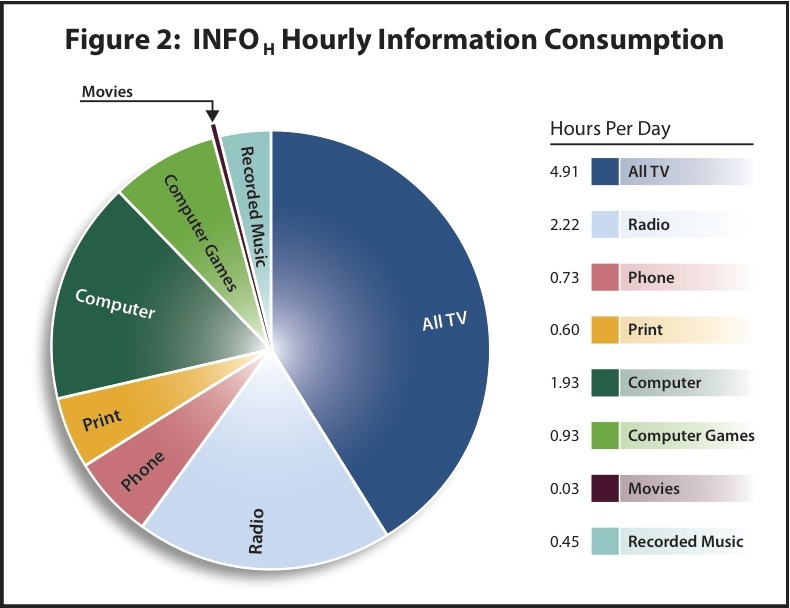 What kinds and how much information do Americans consume? My group did a thorough study on this topic for 2008. The basic answer is we consume far more than anyone realized, and even though there are still only 24 hours in a day, the amount continues to grow exponentially. To put it crudely, in 2008 an average American on an average day consumed the equivalent of a 1080p Blu-Ray movie per day. This was several times the size of the largest movies available to consumers at that time, and more than the size of 1080p cable TV movies even in 2016. We did a long report on American consumers (households) exclusively. You can read the Executive Summary and a full report on American households, here. How Much Information? 2009 Report on American Consumers by Roger E. Bohn and James E. Short. A 3-D plot shows how different measures (words, hours, or bytes) give very different rankings for different media. TV is big by all three measures, for example, but computer games are huge in bytes, but modest in other categories. 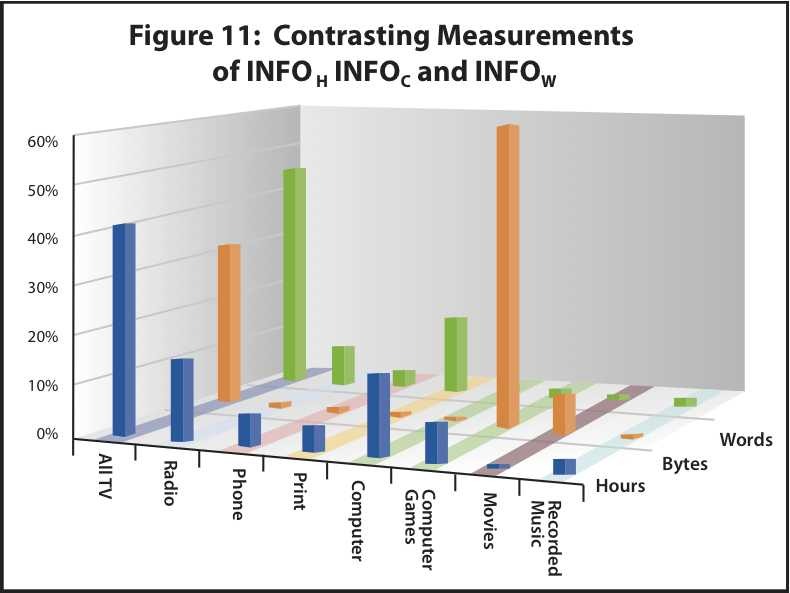 Roger Bohn and James Short, “Measuring Consumer Information,” International Journal of Communication 6 (2012), pp 980–1000. An updated report, by my colleague James Short, is available here. It projects household consumption up to 2015. We measured server information in 2011, in this report. Since 50% of the data attributes to TV. I guess next year’s numbers can easily double or triple as more people switch over to HDTV. Chris – this is a really good point. The reason this study was much higher than past research can point to Video Games having much higher data delivery rates. It’s going to be interesting to see what happens to these numbers as we consume more HDTV at home and streaming video on our mobile devices. These are both interesting points. HDTV will affect our numbers, but not quickly, and we comment on it in our report. While sales began to take off in 2008, according to the Consumer Electronics Association more homes had HDTV sets (53% in January 2009) than could actually get HDTV signals (approximately 40%). Consumption of actual HDTV programs will increase gradually, so that in 5 years it could be much higher than today. On video streaming to mobile devices, bandwidth for mobile video is inherently very low, so it is unlikely to make much of an impact (unless there is a revolution in bandwidth availability).